Just think of the noise! The NOISE, NOISE, NOISE, NOISE! The noise from the girls. The noise from the boys. All wired from a summer of fun and sweet treats. With new shirts on their backs and new shoes on their feets. In your room they’ll come bounding with sweet shrieks of glee. You feel your heart pound. You wake up in a sweat. STOP right there! Don’t tense up in terrible tizzy. All this whining and stressing is making me dizzy. Just calm down. Take a breath. There you go. Feeling better? Let me tell you the reason for this rhyming letter. but let me assure you, there’s nothing to fear. But when you take a step back they’re just lipstick and rouge. BE there to greet them with a smile on your face. BE kind so they know that your room’s a safe place. BE attentive and listen; they may have fears too. BE humble. Remember it’s not all about you. BE curious. Ask questions that make their minds fly. BE unsatisfied with answers if they can’t explain why. BE okay with mistakes. Show you learn when you fail. and BE sure they know that’s what it takes to prevail. They may not recall what was stuck on the wall. I hear a lot about our broken education system. I’ve read many blogs describing the large-scale, invasive systematic changes that need to take place in order to “fix” education. These broad and overwhelming reforms are so massive and so dramatic I can’t imagine they have any hope of actually being implemented. The change would be too drastic. What I can imagine is a change that’s more “small-scale”. What would happen if we all agreed to change just one “little” thing? Could one simple change make any difference? Here’s what I’m thinking. What if I decided, as a teacher, that my students would never again take another multiple choice test? What if my school or district decided to do the same thing? Could this one, simple change make a bit of difference in our student’s learning, critical thinking, and problem solving abilities? In his book, Stop Stealing Dreams, author Seth Godin tells the story of Professor Fredrick J. Kelly. In 1914 our factories were in need of workers and we needed a quick, efficient means to process and educate the throngs of immigrants coming to the US. Professor Kelly invented the multiple choice test. He described it as “a test of lower order thinking for the lower orders. ” Just a few years later however, Kelly actually disowned the test he invented saying that “it was an appropriate method to test only a tiny portion of what is actually taught and should be abandoned“. Did we abandon it? 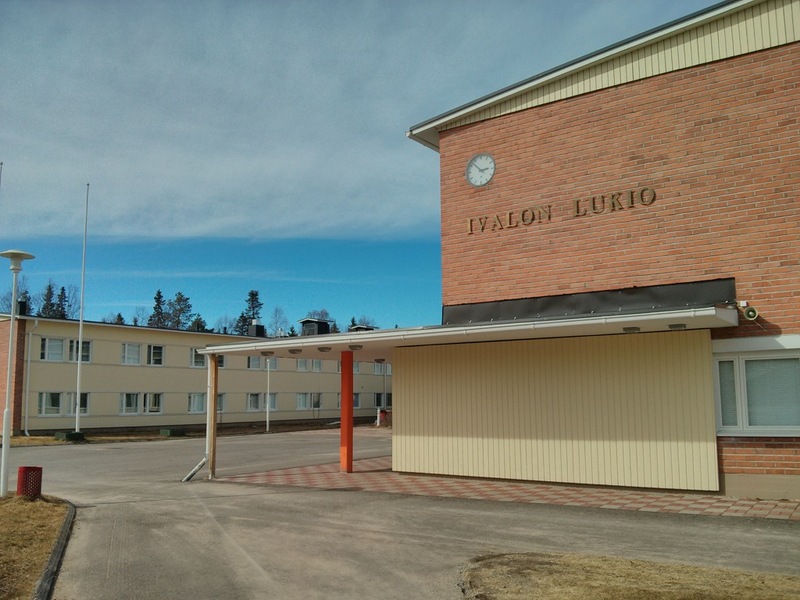 Last May I had the opportunity to visit a couple of schools in Finland thanks to a generous invitation from my friend and colleague, Janet English. I only had one week in Finland – enough time to get a glimpse, but not enough time to observe and discern the real beauty of the Finnish Education system. Janet had six months to observe classes and talk with teachers and students. Thankfully, she shared her thoughts and observations in her own blog and a two part article for OECD Insights. 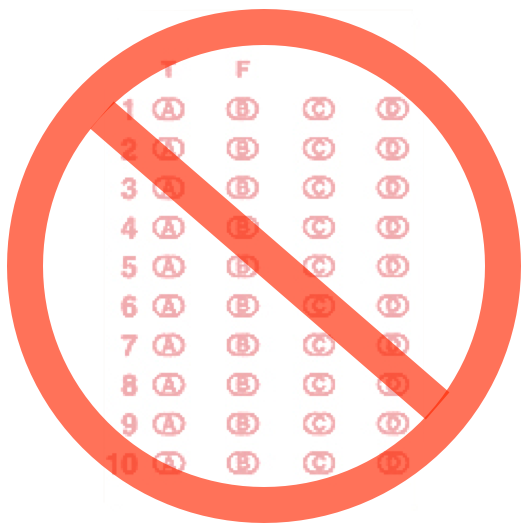 So what would happen if we stopped giving our students multiple choice tests? What makes Professor Kelly’s test so appealing is that it is so easy to administer and score, especially since it can be graded electronically. Will teachers thank you for taking away this form of assessment? Probably not at first. In fact, they might actually complain that forcing them to use other types of tests will take much more time to grade because their students would have to explain what they know rather than just picking from a list. What if, as a result, teachers started designing shorter tests or tested their students less frequently? Would that be such a bad thing? Eventually, as an alternative, teachers might have to resort to other methods of assessing their students’ learning. Methods that could include having students create digital projects that provide evidence of their mastery of particular concepts and standards. 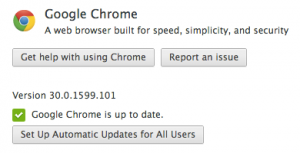 I wonder…Could one simple change, make any difference? When does a three and a half day week seem 7 days long? When it’s the first week of school. Between all the last minute prep to get ready for last Tuesday (our first day with students), open houses and BYOD orientations for parents, and all the little technology glitches that no amount of preplanning can prevent, I sit here on a Saturday morning in the customer lounge of my Honda dealer basking the the peace and quiet while my car is serviced. Exhausted. When my intercom line beeps with a call from a frustrated teacher because their computer was updated over the summer and their passwords no longer autofill, or they can’t connect to their SmartBoard, or they can’t print, or some other technical issue I try to break the tension by answering with a chipper, “Happiest Place on Earth, this is Dennis.” or “Your call is important to me, please stay on the line…” in an attempt to elicit a laugh, a chuckle, or anything to break the tension. Maybe that’s why I’m so tired. Helping others is exhausting. It’s inconvenient. But it’s part of my job – not just to fix the problem, but to help people develop troubleshooting skills so they have the ability and confidence to solve their problems independently. In the back of the Computer Lab I have posted my five rules. 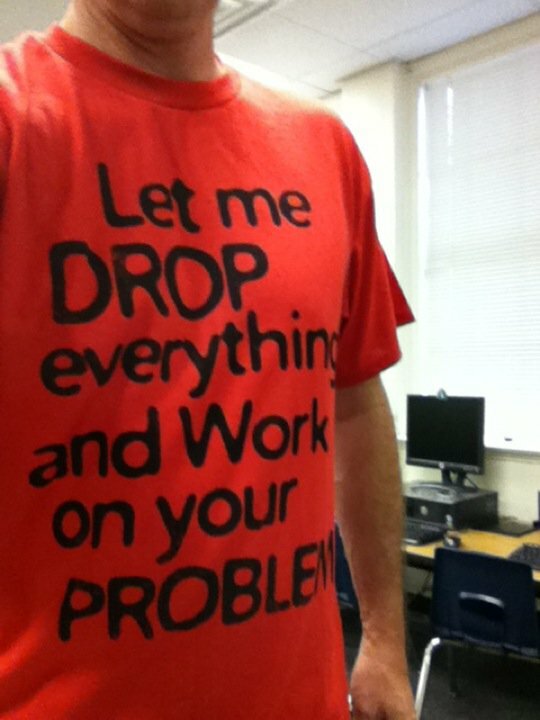 I bet you have many of the same in your classroom. Keep hands feet and other objects to yourself. Raise your hand if you wish to speak. This year I’m going to be adding a new rule. Kids, teachers, and parents have too much stress in their lives – most of it self-inflicted. Technology won’t add stress to your lives if you refuse to let it. When we get frustrated and panic, we make stupid decisions. But if you remain calm while that blinking cursor on the screen taunts you, STOP, take a deep breath, and ask yourself, “What else can I try?” often times a solution will present itself. And when it doesn’t, you go to plan B, plan C, plan D, and remember that the alphabet has 22 more letters. 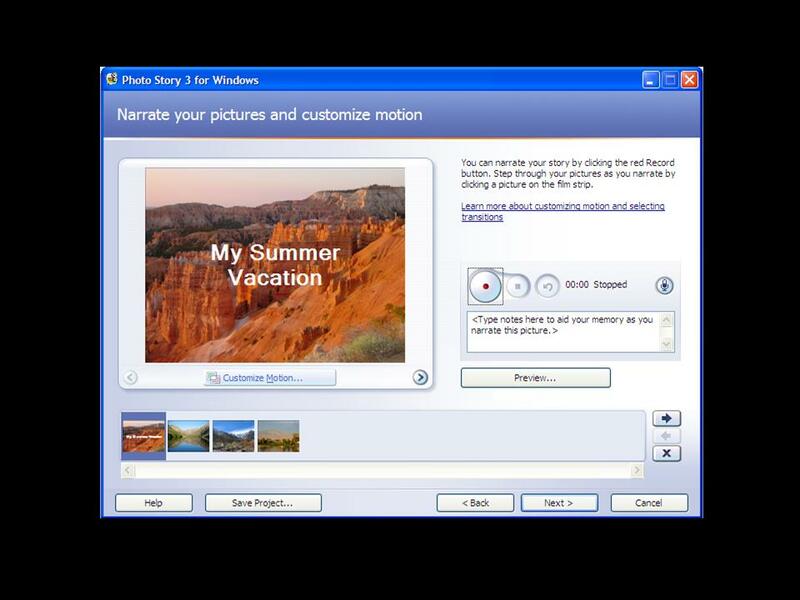 In 2008 I attended my first ISTE (NECC) Conference, in San Antonio. Even from that first experience, I saw that “the entree”, my most valuable takeaway of the conference came in the form of conversations. Presentations, workshops, and sessions were important, but it was the conversations and the connections that occurred between sessions that helped me grow the most and kept me coming back for the next 4 years. This year I missed ISTE. Correction…this year I REALLY missed ISTE. As I slumped on my couch at home, reading all the tweets, posts, and direct messages of colleagues and friends announcing their arrival in San Antonio I couldn’t help but feel envious. Envious of all the face to face meetups, jealous all the sharing and learning that would not include me. But I was not alone. There were others on twitter who, like me, also felt like the kid who couldn’t go to the prom. 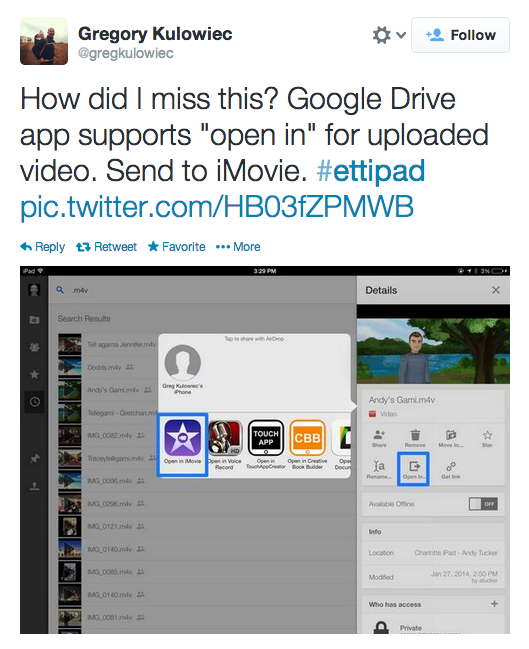 We all had our reasons, but bottom line – ISTE was happening without us. Then something truly magical happened. Our collective online “pity party” took a turn that I could not have predicted. A community was born. I noticed all the amazing educators posting #NotAtISTE hashtags on Twitter and started up some conversations. 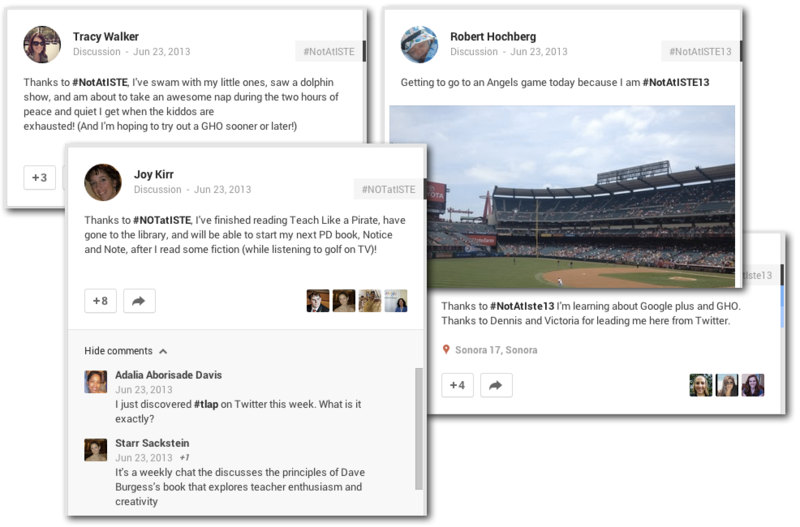 One particular conversation with Victoria Olson (@MsVictoriaOlson on Twitter) led me to create a Google+ Community where all those of us who could not go to ISTE would be able to share links, resources, and ideas. We may not be able to meet face to face and have conversations like those in the Bloggers Cafe, but we could use Google Hangouts to create a virtual Blogger’s Cafe. I threw it out there on Twitter. Would anyone show up? 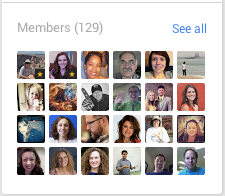 The next day our community had over 40 members and by the end of ISTE we had grown to 129. We commiserated with each other and tried to cheer each other up by posting all the fun things we could do because we were #NotAtISTE. We also shared resources and had some fun and thoughtful “face to face” conversations in Google Hangouts. We discussed how to truly integrate technology for student learning, how to encourage teachers to move beyond mere technology substitution and grow to augmentation, modification, and eventually to redefinition (the SAMR Model), and so much more. 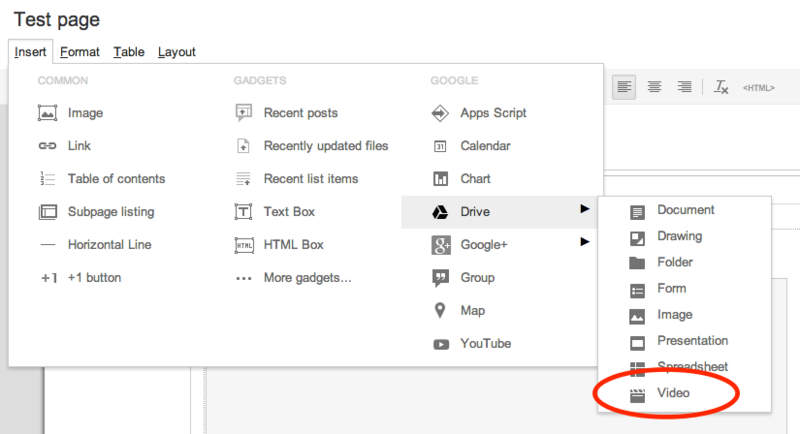 Thanks to Josh Gauthier (@mrgfactoftheday) for taking the initiative and jumping in to host some live hangouts. The growth and sharing was truly organic. As a result of this group I also had a chance to really dig in and learn about Google Plus and how truly powerful it can be to connect people with other people. I don’t know if we would have had the technology even just two years ago to pull this off. The sense of community from this group went beyond just education chat, we were building relationships here. We’re even planning to have a real #NotAtISTE13 meetup at ISTE 2014 in Atlanta. As much fun as it was to be #NotAtISTE, I hope I get to go next year. I can’t wait to meet my new friends face to face. 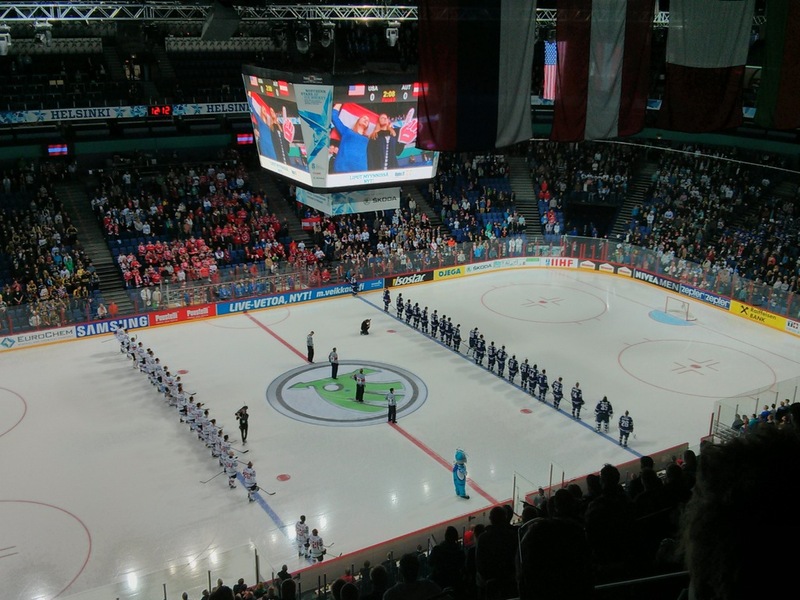 This is the second part in a series of blog posts sharing what I learned during my visit to Finland May 3-14, 2013. Before leaving for Finland I read articles and blogs, and watched videos like Pasi Sahlberg’s TED Talk and “The Finland Phenomenon” (http://vimeo.com/32210434). I wanted to learn about all the amazing teaching and learning going on in Finnish schools. I arrived expecting to see engaging, dynamic lessons that would blow away anything happening here in the US. I was expecting Finnish schools to look drastically different than American schools with thoughtfully designed creative learning spaces, and state of the art classrooms. I was expecting to see classes full of focused, attentive students, actively participating and producing awe-inspiring projects. That’s the problem with expectations. They are used as a measuring stick to evaluate what we see. “This exceeded my expectations.” “That did not meet my expectations.” Expectations put an ideas in our heads and focus our attention to look only for certain things and not notice important details that fall outside that focus. My colleague Janet warned me not to let my observations be skewed by expectations, but rather to go in without any expectations at all and see the teachers, schools, and students for what they really are. I’m thankful for her advice. I’ve now had several days to process what we saw, heard, and talked about. The Finnish schools I saw did not look that much different from schools in the US. Desks, chalkboards – yes I said, chalkboards. Student artwork decorates the halls. What I noticed is how clean and well maintained they were. Students walk the halls in socks – they are trained to leave their outside shoes by the door to prevent tracking in snow and dirt. I didn’t see an abundance of technology. The school in Ivalo had a computer lab not unlike those at many US schools, and the school in Utsjoki had a distance learning room equipped with a SmartBoard, but overall they were not equipped as well as many schools here in the states. 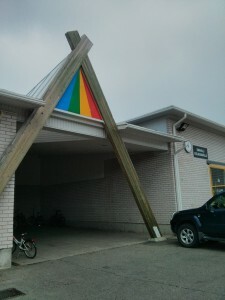 Now I admit, we were visiting rural schools 200+ kilometers above the arctic circle, but Janet informed me that while there are some schools that feature some pretty innovative learning spaces, most are what we would recognize at typical schools. Finnish teachers I met know their students personally. The schools I visited were small rural schools but I was told that even the largest schools in Finland don’t have more than several hundred students. This allows teachers time to build relationships, and develop an understanding of individual student needs. Teachers stress less about themselves and all they are required to teach, but focus more on each student and what they need in order to learn. Isn’t that what differentiation is all about? One major difference between Finnish and American schools is that these teachers do not have all the standards we do. In fact, they don’t have “standards” at all. Instead their national core curriculum has “objectives”. These objectives are a lot more open-ended, like essential questions, and allow teachers to design lessons and activities that get students asking their own questions, thinking critically, and solving problems. Individual schools are in charge of their own curriculum and teachers are free to decide the best methods for teaching their students. If you look at their national core curriculum you’ll see, listed under their objectives for each subject area, core contents to be integrated into these objectives. The emphasis appears to be on practical examples, real world experiences, problem solving, and critical thinking rather than lists of facts to be memorized and tested. I encourage you to check them out for yourself. The Finnish teachers we saw don’t take home stacks of homework to grade. The teachers I observed check to make sure homework is done, but that homework has little effect on students grades. 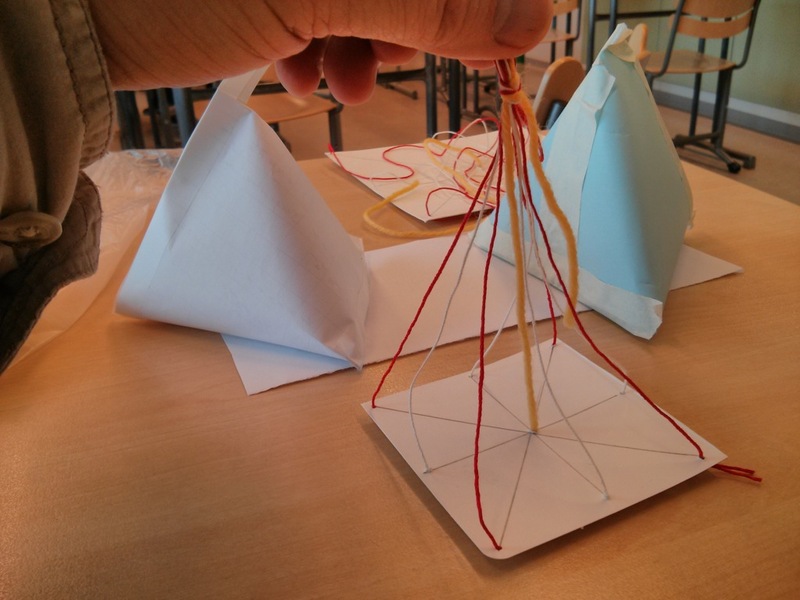 Proof that students understand and meet the objectives is determined by assessments and student projects. The don’t send home progress reports, but do communicate to parents when students are struggling. I mentioned in my last post that students are trusted with more personal responsibility. This translates to a greater personal responsibility for their own learning as well. Finland doesn’t have standardized testing like we have in the US, but that doesn’t mean they don’t test. They have one standardized test that all students take when they are 15 years old. They also have a matriculation exam to check and see if students are ready for upper secondary school and another one to determine if students go to University or Vocational School. The National Board of Education also randomly selects a sampling of basic and secondary schools for testing each year. Here’s the big difference. Those test are developed and administered by the National Board of Education, not private for-profit testing companies, and the purpose of those tests is to see how schools across Finland are doing as whole. These standardized tests are not used to evaluate individual teacher performance or rate schools as good or bad. Schools and teachers are not in competition with each other. The Finnish teachers I met seem to have great respect for American teachers. In fact, many lesson and projects ideas used in Finnish classrooms come from American teachers. They feel that American teachers are among the best, hardest working teachers in the world, yet they are stuck in a system that is broken. A system that emphasizes picking correct answers over producing products that demonstrate student problem solving and critical thinking. Wonder what might happen if you took an American teacher and a Finnish teacher and let them switch places? Here is what Finnish education expert Pasi Sahlberg thinks: “What if Finland’s great teachers taught in U.S. schools?” The last three paragraphs of the article answer the question. I’m thinking this might make an interesting TV Show for next Fall: “TeacherSwap”. This is a reality show I might actually watch. This is the first part of several blog posts sharing what I learned during my visit to Finland May 3-14, 2013. You know that feeling you get in the pit of your stomach as you near the front of the line to ride that scary new roller coaster for the first time? That’s the best way to describe the feeling I had stepping on to British Airways flight 268 from LAX to London – the first leg of two flights that would take me to Helsinki, Finland. I was full of anticipation and excitement, mixed with a little anxiety. This would be my first ever trip to Europe. After months of mental preparation it was actually happening. So why Finland? And why was I using my full allotment of personal days and spending my own money to jet off for 11 days in the middle of May? 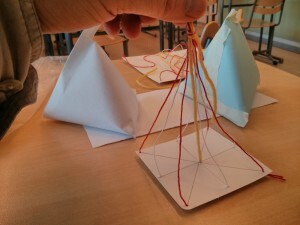 My good friend Janet English (http://eltorofulbright.blogspot.com/) has been in Finland since January on a Fulbright Scholarship studying how Finnish schools teach problem solving. Her project has her visiting schools and interviewing students & teachers all over Finland to get their story. For the last several years Finland schools have been the focus of world attention because of their students high scores on the PISA, an international test that “looks at students’ ability to apply knowledge and skills in key subject areas and to analyse, reason and communicate effectively as they examine, interpret and solve problems.” (http://www.oecd.org/pisa/pisafaq/) When she invited me to join her on an adventure north to visit schools in Lapland, how could I refuse? Janet arrived in Helsinki Sunday afternoon, just in time for dinner and another hockey game. Monday morning our adventure to Lapland began. We flew to Ivalo, which is about as far north as commercial airlines will take you in Finland, then drove another two hours north from there to Kevo Subarctic Research Institute (http://www.kevo.utu.fi/en/). This would be our “home base” the next week. Since Kevo is 350km north of the Arctic circle we were blessed with 24 hours of daylight. While the sun would dip below the horizon for a couple of hours it never really got dark. In another month, it won’t even set, but rather just make a 360 degree circle around the horizon. 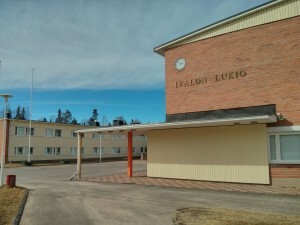 The next day we were off on my first school visit, a small Jr/Sr High School in Ivalo. As soon as we arrived the difference between Finnish schools and US schools was evident. Doors were unlocked. We just walked in. I admit I was a bit uneasy as we walked the halls. With security such a big issue in US schools, I couldn’t help but feel we needed so sign in somewhere, get a badge, or be escorted by someone official. Janet assured me we were fine. Finnish schools are open like this. When we finally met the school administrator with whom we had arranged our visit I was much more at ease – even though I really had nothing to worry about. The math teacher created this card with string to help her students understand triangles in geometry and showed me how to fold a rectangular piece of paper into a triangular prism to teach surface area. She brought us to the English class. Finnish students start studying English in first grade. One the high school students gave us a tour of the school and answered our questions – in English of course. Once again I felt a bit humbled that I only speak one language. We toured the school, observed math, chemistry, and art classes, and joined the Finnish teachers at their table in the cafeteria for lunch. Students here have a lot more independence than their American counterparts. In this school, they have their own student lounge with couches and coffee. Students (age 15-17) who travel more than 50km to school stay overnight during the week in a building adjacent to the school. There they take care of themselves, even preparing their own meals. The next day we visited a smaller school in Utsjoki – at the very top of Finland. Here we met with their science teacher, a very talented yet humble man. He shared how his students learn principles of science by studying the outdoors right around them. They learn about biology by studying their own environments and how they survive and interact with it. We also met and spoke with a Sami teacher, a native Laplander, who teaches the Sami language to students at their school and others using their distance learning classroom. For lunch we enjoyed a delicious salmon soup in the cafeteria, and then met with students in the English class. There we talked with them, in English, about life in Southern California. Our life is quite a contrast from theirs. They wanted to know about Los Angeles, earthquakes, and life a metropolitan area that has more people than their entire country. It was a good opportunity to let them hear that there is more to America and Americans than just what they see in the media. Conversely, their lives are quite different from anything I could imagine growing up. One of the students in the class actually works as a reindeer herder. I suppose the definition of “fast food” is a little different here, but that’s not a bad thing. In fact I found reindeer quite tasty. 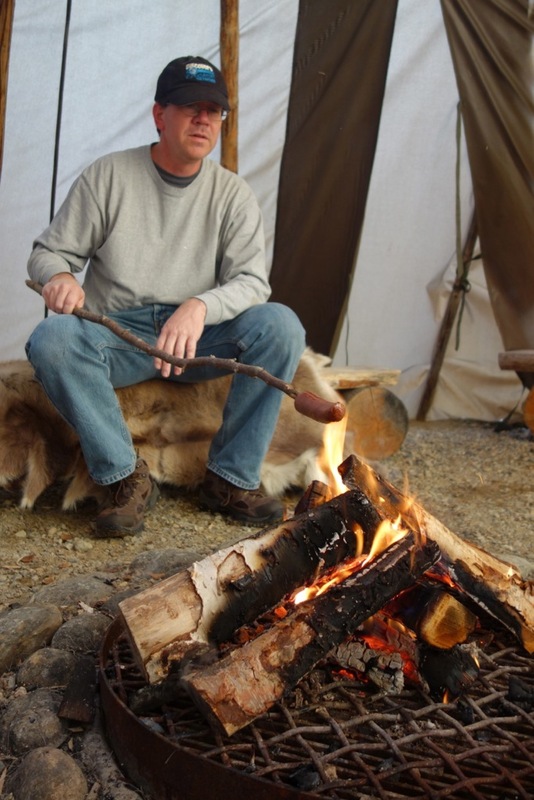 That’s me sitting on a reindeer hide roasting reindeer sausage over a fire inside the “kota” (a teepee) at Kevo.